All her life Englishwoman Gladys Aylward knew that China was the place where she belonged. Not qualified to be sent there as a missionary, Gladys works as a domestic to earn the money to send herself to a poor, remote village. There she eventually lives a full and happy life. But Gladys discovers her real destiny when the country is invaded by Japan and the Chinese children need her to save their lives. Back in 2003 when I glanced at the DVD cover of 1958�s The Inn of the Sixth Happiness, I groaned. Based on its image of Ingrid Bergman, I feared that it would follow in the footsteps of the dull and insipid Love Is a Many-Splendored Thing and feature a very non-Asian woman as an Asian character. While a few other western actors do portray Chinese characters, despite the garb worn by Bergman in that cover shot, she doesn�t play an Asian. Instead, she portrays former chambermaid Gladys Aylward, a woman who aspires to do missionary work in China. Dr. Robinson (Moultrie Kelsall), the head of the China Missionary Society in London, won�t send her due to her lack of education and experience. Gladys pursues passage on her own and works to save the necessary money to pay for a train ticket. Gladys eventually pays for this and she gets some help from her employer, Sir Francis Jameson (Ronald Squire), who connects her with a missionary named Jeannie Lawson (Athene Seyler). The latter plans to build an inn for mule trains that pass through the area; that will allow her to spread the Christian gospel. Along with a cook named Yang (Peter Chong), the group launches their little enterprise. In the meantime, we meet the local Mandarin, Hsien Chang (Robert Donat), and Captain Lin Nan (Curt Jurgens), a Chinese military officer of mixed Eurasian heritage. Lin Nan is there to get Hsien Chang to enforce the laws against the binding of female feet, but the foot inspectors fail in their work. When the elderly Lawson dies, Gladys takes over the inn. Unfortunately, the missionary group that helped support them did so out of respect for Lawson; with her gone, they retract their financial aid. Gladys decides to persevere anyway. We follow her path as well as an eventual relationship with Lin. 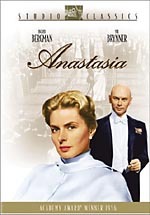 1956�s Anastasia earned Bergman an Oscar, and she deserved it because carried that otherwise unexceptional film. The actress gets more help during Inn, but she remains the main reason it succeeds. The unrelentingly good and noble character of Gladys easily could have become insufferable, but Bergman totally avoids the part�s perils. Bergman offers a bright and earnest portrayal that never becomes smug or annoyingly chipper. Bergman makes her character honest and likable and never comes across like some untouchable saint. Though allegedly from Liverpool, Bergman doesn�t bother to attempt an English accent, but given her sweet and endearing performance, I don�t care. Though he doesn�t look remotely Asian � or even Eurasian, as touted here � Jurgens brings a nice sense of strength to Lin Nan. Both he and Bergman remain low-key and appropriately subdued throughout the movie, and that makes their romance more powerful. They don�t go all mushy on us, so we care about them even more. The restraint exhibited allows us to see them as real people and not just artificial movie creations. That lack of sentimentality shows up through the whole film, and this makes it more effective. Various issues aren�t telegraphed, and although it�s a little lame to see yet another story of a western woman who �saves� so many eastern people, the movie fails to become condescending or superior. It never treats the Chinese as exotic playthings or baubles. Instead, the film sees them as real people and conveys that attitude of respect from start to finish. Not much about The Inn of the Sixth Happiness comes across as spectacular, but most everything about it works nonetheless. A nicely unsentimental combination of romance and social issues, Inn seems well paced and involving. Much of this comes from another solid performance from Ingrid Bergman, but the flick succeeds in many other ways as well. 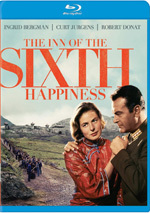 The Inn of the Sixth Happiness appears in an aspect ratio of approximately 2.35:1 on this Blu-ray Disc. Though not stunning, this was a largely pleasing transfer. Sharpness mostly seemed positive. Some shots periodically tended to appear a little soft and ill defined, but those were the exceptions. The majority of the movie looked pretty accurate and concise. No problems with jagged edges or moir� effects occurred, and neither edge haloes nor noise reduction created artificial distractions. The image seemed free from print flaws, which left it with a clean appearance. Colors appeared fairly subdued but well-depicted. With a mild blue emphasis on display, the tones rarely seemed particularly vivid, but they also fit the film. Black levels seemed dense and deep, while shadows were mostly smooth and appropriately visible. A few �day for night� shots presented moderately opaque images, but those didn�t create substantial concerns. As a whole, Inn offered a positive presentation.. The DTS-HD MA 4.0 soundtrack of The Inn of the Sixth Happiness seemed good for its age. The soundfield remained pretty restrained but still opened up at times. Music demonstrated reasonable stereo imaging, as the music spread across the front with fair delineation. Effects used the side speakers to moderate impact and also utilized the back speakers on occasion, such as at a train station or a marketplace. Speech remained mainly centered, with a little bleeding to the sides but no obvious localized dialogue. This wasn�t a remarkable soundscape, but it was well above average for 1958. Audio quality seemed good for the era. Speech suffered from some weak dubbing but was distinct and lacked any issues connected to intelligibility. While I couldn�t call the lines consistently natural � mainly due to the looping � they were perfectly fine most of the time. The score was fairly dynamic and rich given its age. Effects also came across as reasonably accurate but without great range. Those elements failed to display problems but they also didn�t show much spark. Nonetheless, the track worked well for its period and fit the movie nicely. How did the Blu-ray compare to the 2003 DVD? Audio showed a broader soundscape and improved fidelity, while visuals were cleaner and more accurate. Though the DVD was good for its format, the Blu-ray provided a superior presentation of the film. Most of the DVD�s extras repeat here, and we open with an audio commentary from documentary filmmaker Nick Redman, The Films of 20th Century Fox co-author Aubrey Solomon, and Ingrid Bergman biographer Donald Spoto. All three were recorded separately and their comments were edited together for this piece. Inn provides a good chat, as we learn about a wide variety of topics. The track starts with great notes about the life of the real Gladys Aylward, and those elements pop up throughout much of the commentary. We also find many nice facts about the creation of the film, the folks who participated in it � especially Bergman � and other pieces that relate to the flick. We also find out what the real Aylward�s personality was like and that she vehemently opposed the casting of Bergman among many other intriguing subjects. The excellent information comes at us virtually constantly and really adds a lot to our appreciation of the movie. It�s a terrific listen. What does the Blu-ray drop from the DVD? It loses a restoration comparison as well as ads for other �Fox Classics� releases. I view The Inn of the Sixth Happiness as a pleasant surprise. The movie seems somewhat sugarcoated much of the time, but it achieves its goals as it provides a lively and moving examination of its subject. The Blu-ray delivers good picture and audio along with an informative audio commentary. Chalk this up as a quality release for an enjoyable drama.